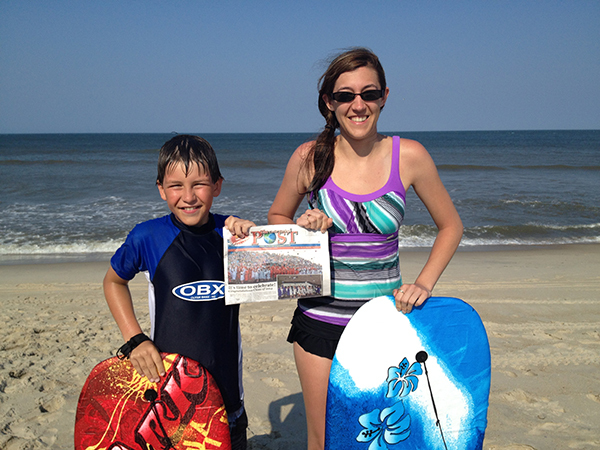 The Steinebach family took the Post with them on a family vacation to Rodanthe, North Carolina this past summer. Pictured is Cayden Steinebach, age 10, and sister Monica Dean, 26, children of Curt and Carol Steinebach. They spent a week in a house on the beach of this Outer Banks town. “As the picture shows, there was a lot of time spent riding the waves on their body boards and soaking up sun on the beach,” said Curt. Cayden was pictured previously in the January 31, 2013 Post, with a picture of their trip to Walt Disney World. “He thought that was pretty cool and wanted to make sure we brought the Post for our trip to North Carolina this year,” explained Curt. Thank you, Cayden, and the rest of the Steinebach family, for taking us with you on your vacation! It sounds like it was fun!